Halloween is days away and the weather is just now cooling down here in Los Angeles. 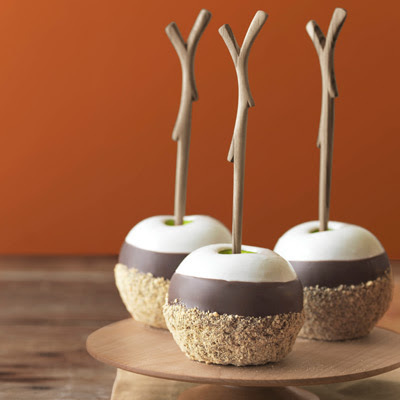 With the weather finally acting its season, I decorated my apartment with pretty Fall paintings and flowers and whipped up a couple of Halloween treats-- including these Caramel Apples. To work I went; tasting, testing, eating and enjoying. 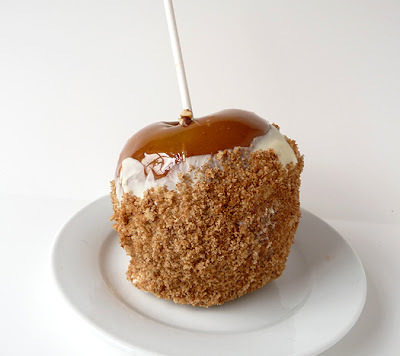 I have to say the The Sweet Heat Candy Apples are my fave with just the right amount of sweet and heat. 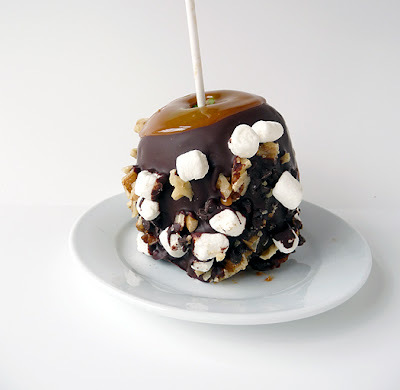 Caramel Apples are really easy and fun to make. Give it a try and let me know what you come up with! 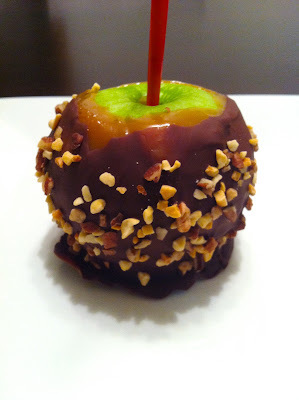 Caramel Apple recipes I found. Each of these Caramel Apples start out the same. 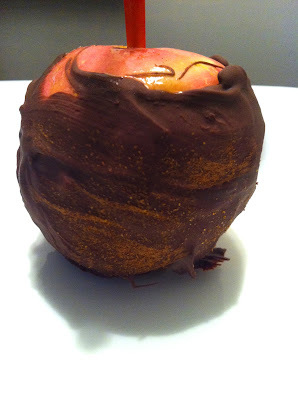 You want to pick out proportionate, healthy looking (organic if possible) apples and wash them really well. 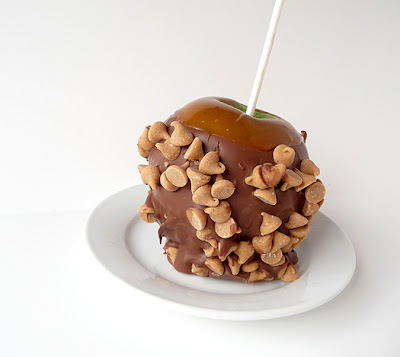 Cut out the stem of the apple and insert a candy apple stick, a cleaned stick from a tree or a chop stick (what I used). Take a baking sheet and spray with cooking spray or wipe down with a little vegetable oil. There are many options when it comes to how you want to make your caramel. You can make it from scratch, or, being new to this, I opted for ready-made caramel dip which you simply heat over the stove. Once the caramel is warm, tilt the pot and roll your apple, coating it in an even layer of caramel. Follow one of the recipes below from here or come up with your own creation! Sweet, salty and crunchy, who can say no? 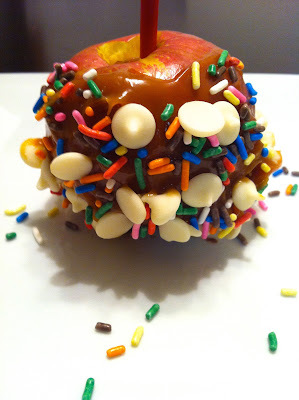 Coat apples in melted caramel. Put back on the baking sheet and let it cool in the refrigerator for 20 minutes. Melt dark chocolate over medium to low heat, stirring constantly. This part can be kind of tricky. There's a thin line between melting and burning your chocolate. If it becomes doughy, you've burnt it and your going to have to start over. Once it starts to melt, keep stirring and lower the heat. Take your caramel covered apple and dip it in the melted chocolate. 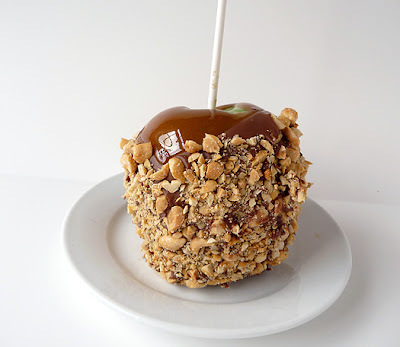 Transfer apple to a plate and sprinkle with coarse sea salt and peanuts (or any other kind of nut you want to use). Put back in the refrigerator for 30 minutes, then enjoy! Colorful and sweet, this treat is a party in your mouth. Transfer caramel coated apple to a plate and sprinkle with white chocolate chips and rainbow sprinkles. Put in the refrigerator for about 30 minutes and eat! More on the savory side, this treat pack the right amount of sweet and heat. Transfer chocolate coated apple to a plate and sprinkle with desired amount of cayenne pepper and cinnamon. Put in the refrigerator for about 30 minutes and then it's ready to eat! oooh, thanks for reminding me that I haven't had one yet this season! 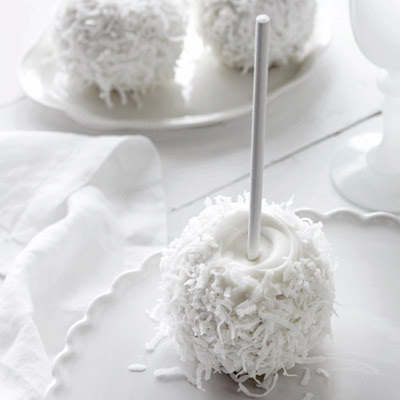 Omigosh, this looks so delicious! These pictures are gorgeous. Thank you for sharing! I will definitely have to try out these treats soon.